As you may have heard, the world is ending on May 21. All the teachers, and all the students, are like, no way! Not before school’s out! The world will end on May 21. I believe that. The world ends every day. I was on the rooftop of a building downtown. They had a little swimming pool, chaise lounges, and a view of everything north of 20th Street. I’d seen an apartment, underneath. I’d taken off my heels to walk barefoot on the impossibly smooth concrete floor. The kitchen had a black marble-topped island. The chocolate brown couches were new. I’ve never bought a piece of furniture that was new. And I’m less familiar with that view. I haven’t often looked north. The view I used to have was east. 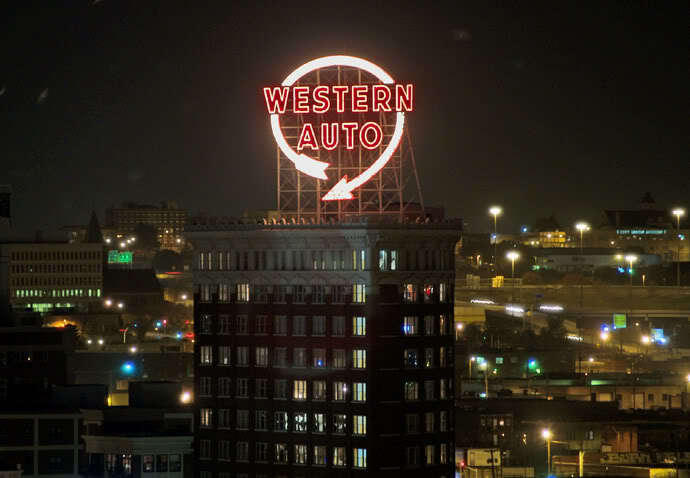 The Western Auto sign. I loved that thing so much I always referred to it as “my husband.” Tension Envelope. And south. Union Station. The Liberty Memorial. We used to sit in the brick oven of an upper floor and love each other, too overheated to touch. Sweaty people only get romantic in the movies. In real life too hot is not hot. We used to worry about how the buildings were being rehabbed, one by one, and worried by people moving in who had enough money to afford air conditioning and new cars and bathrooms with regular faucets and showers, regular kitchens with regular refrigerators and stoves. People who didn’t need huge ceilings to make huge paintings or sculptures or parties. People who wouldn’t walk around barefoot on that hundred year old pine floor, which was always so filthy the bottoms of my feet were imprinted charcoal. It was a relief to think you were better than them because beautiful broken things moved you, and you still smoked. It was a relief to think you loved things more than they did, that money wasn’t important to you, and that was why you didn’t have any. That screaming and crying when your car broke down was worth the freedom you had, and the curiosity, and the openness. Having your car break down would break you. Maybe it was worth it. But they did move in. They have moved in. I was many years with the southern and eastern view. In Kansas City, looking east from the center is looking at decay, at what has crumbled, and been let go, what has grown its scraggly way, aggressive and gorgeous and heartbreaking, like what my dad called the “creeper” vines. The ones he cut back year after year, that crawled out again and again. There was nothing ugly about them. They were admirably persistent. They might choke other plants, though. To look south is to look at the overgrownness, at least in my mind. When I was in high school, 103rd street was the edge of civilization. Now, I’m told, the city (if you can call it that) bleeds out 150 streets. Looking north, there is that hotel with the light show. The new roofs of the new performing arts center. The Power and Light building, color coded. And north is to the river. Always to the river, even though the river isn’t important. No one goes there, much. It’s why we’re here, even though it doesn’t matter anymore.